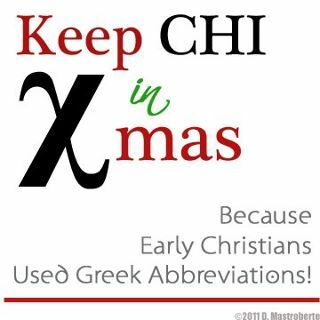 Keep the Chi In Xmas! I like this because it gets to the heart of a common misunderstanding. I can't tell you how many times I have heard people complain about Xmas - "Don't take Christ out of Christmas!" In reality, that is not what is happening. Actually, Christ is in the "X," the Greek letter Chi, which is the first letter used to spell "Christ" in Greek. It is an abbreviation, one used quite often by early Christians. So next time you see Xmas in a store don't tell them "hey, put Christ back in Christmas." Instead you might thank them for partaking in a ancient Christian tradition of referring to Christ with a Greek letter. I doubt many will know what you are talking about. Thanks to James McGrath and Brian Leport. Students of the Bible in the twenty first century tend to approach the gospels as a set of written sources relating the life and work of Jesus. What is often not considered is the development and origins of this literature and how this may influence our understanding and interpretation of the gospel. Therefore, in order to appreciate the gospels fully it is necessary to examine what type of literature they are and how we came to possess them in their current form. Over the last one hundred years or more there have been many attempts to understand what kind of literature the gospels represent. Some scholars tried to argue that the gospels are a unique kind of literature that is not explainable by comparison with any other literature from the ancient world. This was an accepted view until more recent decades. For a while it was assumed that the gospels were a result of the influences that Old Testament and other Jewish literature may have had on the gospel authors. For instance, in Jeremiah we are introduced to the prophet’s background, the dating of his ministry and a report of his call by God. This is then followed by an account of his words/speeches and actions as he proclaimed the message of God. Similar in nature is the first century CE Jewish work Lives of the Prophets which provides an account of the canonical prophets lives and ministry in a way that was considered biographical for the times. While the above literature at least represents a connection with the gospels, there are still many aspects that differentiate between them. A more recent development (since the 1970’s) has been a comparison of the gospels with the Greco-Roman biographies that were in circulation. An example of such are Plutarch’s Lives of famous Greeks and Romans, Suetonius’ Lives of the Caesars, Philostratus’ Life of Appollonius of Tyana, and Diogenes Laertius’ Lives of the Ancient Philosophers. Ancient biographies have some similarities with the modern form of the genre, but there are also many differences. They were often composed by famous people about famous people. They were not interested in presenting an outline of factual information but rather passing on long standing traditions. They were generally narrative accounts that gave the impression of being objective. But the overall purpose was to serve as propaganda, to provide selective information about the hero of the story while exhorting the reader to imitate the hero. Over at the Centre for Public Christianity Craig Keener has sat for an interview on the relationship between the gospels and ancient biography. Keener has done much work on the gospels and the historical Jesus. The interview provides a good overview of the topic and provides some insights about how to read the gospels in this context. 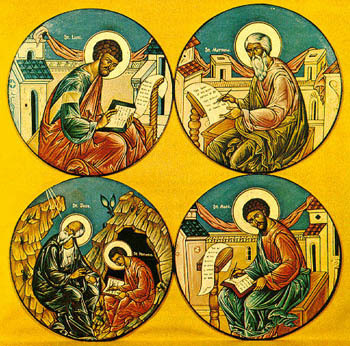 Gospels as ancient biographies I from CPX on Vimeo. Gospels as ancient biographies II from CPX on Vimeo. 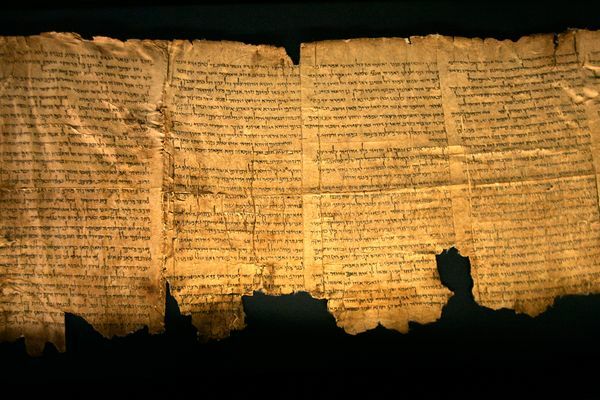 The Dead Sea Scrolls were first discovered in 1947. The collection consists of more than 900 scrolls that include biblical texts as well as sectarian literature. They were discovered in the area known as Qumran among the caves overlooking the Dead Sea not far from Jericho. Early on it was suggested that the scrolls were the work of a Jewish sectarian group known as Essenes mentioned by the Jewish authors Josephus and Philo and the Roman author Pliny the younger. The area excavated nearby the caves revealed a compound with a complex of ritual baths, a dinning room, and perhaps a scribe's room with a table where the scrolls where written. But over the last 25 years there have been some challenges to the Essene hypothesis. Some has suggested that there is no evidence that the scrolls were written by Essenes or even at Qumran. 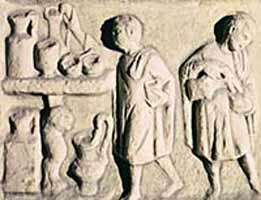 One scholar suggested that the scrolls had been brought to the caves from Jerusalem and other places to hide them from the approaching Roman army and that the compound was actually a Roman villa. The good thing about challenges to a widely accepted hypothesis is that it makes us look at the information again and make sure that there is nothing new to learn. And some times we discover we were wrong. Recently, a piece of evidence has emerged that may give some weight to the Essene hypothesis. Among the items discovered in the area of Qumran was a variety of textiles, some linen, some wool. It is has now been determined that the only textiles that came from Qumran were made of linen. Here is the abstract to the article in Dead Sea Discoveries. Among the Qumran textiles that were kept at the Rockefeller Museum was a group of textiles that were unusual for Qumran. Most of them were made of wool, and some were dyed or decorated. Their marking QCC—Qumran Christmas Cave indicates their origin. In 2007 the cave was investigated by Porat, Eshel, and Frumkin. The cave is located in the bottom section of Kidron valley and doesn't belong to Qumran caves. It can now be determined that all of the textiles from Qumran are made solely of linen. They were free of any colored decoration, except for scroll wrappers that decorated in blue. This, and the simplicity and whiteness of the textiles from Qumran, is compatible with the literary sources. It appears that the people of Qumran wished to differentiate themselves from the rest of the population also on the basis of their style of garments. This is interesting because sources from the Bible and Qumran indicate the kind of material that clothing should be made from. According to Deut. 22:11 clothes should not be made from linen and wool. And according to the War Scroll (1QM 7.9), a sectarian document from Qumran, linen was the material to be used for clothing worn by whoever wrote the scrolls. Thus the authors of the scroll and the people living at Qumran both wore linen to intentionally follow the biblical law and to look different from others. Josephus makes several mentions of the Essenes wearing linen, as note by Todd Beall in his book Josephus' Description of the Essenes as Illustrated by the Dead Sea Scrolls (CUP, 1988). So perhaps this is another piece of evidence in favor of the Essene hypothesis. For more on the recent work done on the textiles see Live Science and Ferrell's Travel blog. One of the things I aim for in the classroom is to challenge students to think in new ways. This means that at times I am purposefully provocative. I will introduce a topic and take a side that I know most if not all of the students will disagree with. This is one way of helping them to see the other side of an argument for or against a particular interpretation or theological stance. Sadly, that is not the case at some institutions. There are places where the only thing that is taught is what is approved by the trustees or the denomination. Sometimes the existence of other interpretations or theologies is acknowledged, but only as a way to demonstrate why they are wrong and why denomination X's statement of faith is correct. And woe unto those who dare even suggest that there might be valid interpretations elsewhere and that students can/should learn from them. It could, in all likelihood, cost you your job. One of the things I like best about teaching at Ashland Seminary is that we have so many denominations represented in our classroom that often the issues will rise up on their own. For instance, it is kind of hard to get around a discussion about, say modes of baptism, when in the classroom you have infant baptizers, those who support believer's baptism and everything in between. And then of course there is the way that different groups look at various portions of scripture. It makes for a stimulating and exciting classroom experience. In this month's Chronicle of Higher Education Brandon G. Withrow has an article that reflects on education along the same lines. He too is interested in helping students to think rather than just teach them how to parrot back lines from "approved" ways of thinking. He talks a bit about his experiences and lists out four things that help make for a classroom where learning can happen. Below is a summary of his four points, but do go and read the whole article here. Acknowledge your own limitations and personal intellectual revelations. Students can (and do) look for mentors in their professors, so if we pretend to have absolute infallibility—or act like complete tools—we should not be surprised when we discover little clones doing the same. Not all books on world religions are equal. To see another perspective, students need guidance in finding quality sources for research. Lectures and books are helpful, but nothing replaces the opportunities that come from face-to-face conversation. In one class, I have my students interview someone of a different religion or worldview. 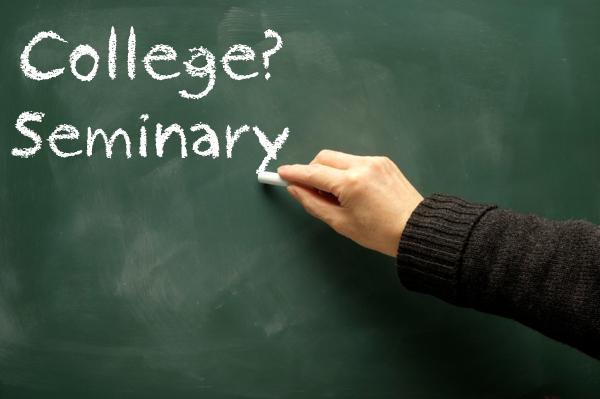 I often receive e-mails from students confessing that they do not know of anyone they could interview outside of their Christian circle—which speaks volumes as to their preparedness for leadership. Make the classroom an active, small-group learning experience. Have students discuss a controversial subject or reading. It often surprises certain students to learn that there are disagreements on beliefs or ideas that had seemed extremely clear and simple. American society is polarized on a number of issues. Religion is and can be just as polarizing as politics. There are those who say God does not exist and would be happy to find ways to remove any visible expression of religion. On the other side there are those who believe in God and think everyone else should too. And the truth is there are fundamentalists on both sides. Sometimes caught in the middle are those of us who study the Bible in an academic setting. We are often ridiculed by both of the above groups. Some think we are wasting our time studying a book about a God who doesn't exist. Others accuse us of destroying the faith of the innocent. Both sides would be happier if our research was giving a boost to their claims. Over at the Huffington Post Amy-Jill Levine and Douglas Knight, have a co-written piece on Biblical Views of God. In this short piece they explain why arguing the God does not exist is as unhelpful as the saying "The Bible says it, I believe it, that settles it." It is a good, thought provoking piece. Here is some of what they have to say. The claims are familiar: humanity could not control nature, did not understand conception or birth, and feared death, and so we invented a God that brought order to chaos, purpose to life and comfort in death. Next, we developed religion to placate the God we invented to assuage our fears of what we could not understand or control. Then, we wrote the Bible to sanction the religion that placated the God that we invented. Next came clergy, to interpret the Bible. And today, we have academics to challenge the clergy who interpret the Bible that explains the religion that placates the God that we invented. Such debates over the existence of God are not only tedious, they are also pointless. Those who believe, believe; those who don't, don't. Belief is like love: it cannot be compelled; it does not function on logical parameters. As some religions would put it, faith is a matter of "grace." For these traditions, we do not summon faith; it summons us. Equally tiresome, perhaps especially to those of us who have invested our lives in seeking to understand what the Bible meant to its original audiences and how it has been received over time, is the frequent claim: "Don't take a biblical studies course; it will destroy your faith." For the most part, if one lecture undermines a religious view, then that view requires deeper interrogation. The simplistic assertion, "The Bible says it, I believe it, and that settles it," does a disservice to both the Bible and to the God the text proclaims. Whether a Creator endowed us with the capacity to think, or whether we are lucky enough to be the heirs of millions of years of evolution -- the two points are not mutually exclusive -- it would be a sin not to use the brains we have. One area of my scholarly focus has been slavery and the Pauline epistles. I have been able to write two books and a number of related articles on the topic. Over at the Reading Acts blog Philip Long has a nice review of an article I wrote for Currents in Biblical Research. He does a good job at summarizing what I said as he thinks about Paul's letter to Philemon.